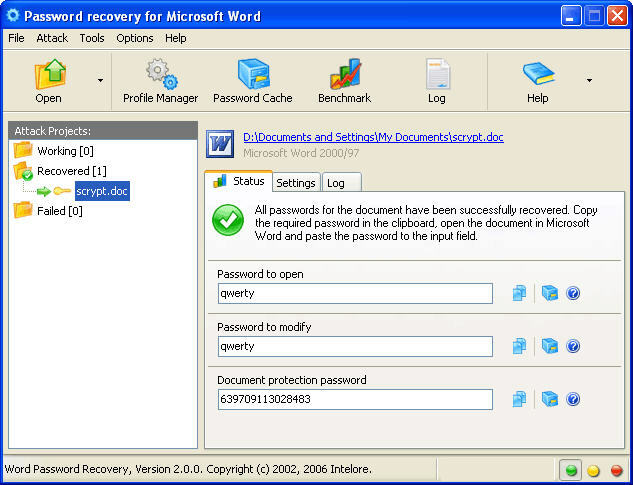 Word Password Recovery is a program that recovers lost or forgotten passwords for Microsoft Word documents or templates. The program recovers all types of passwords, including instant recovery of document protection and passwords to modify. The program supports all versions of Microsoft Word, including 2003. Word Password Recovery instantly recovers passwords for the read only permissions, editing and formatting restrictions, including instant recovery of passwords to open if weak encryption was used. The interface is simple and easy to understand, yet the functionality and the set of features are truly immense. Built-in efficient attack profiles that allow you to recover passwords with a single key press. Instant bypassing of formatting restrictions (limit formatting to a selection of styles) and password recovery for document protection. Microsoft Word modification passwords and editing permission are instantly recovered. Instant password recovery and regaining access to form data input (filling in forms editing restrictions). Limitations to the set of permitted styles for MS Word documents and templates are instantly lifted. Word Password Recovery instantly recovers passwords for the Tracked Changes and Comments features. Recovers passwords in any language (Unicode support) and multilanguage passwords (e.g. containing both Latin characters and hieroglyphs). Comprehensive approach to recovering MS Word (*.doc, *.dot) file-opening passwords, which allows simple attacks such as BruteForce, SmartSearch and dictionary-based, as well as complex approaches combining several types of attacks. Passwords for multiple documents can be processed simultaneously. High performance and optimization for all modern computers, including multiprocessor systems. The password to open a document will be recovered instantly if it was protected using weak encryption. This includes MS Word 95 (and older) documents, MS Word 97-2000 (on a computers with French regional settings) and Microsoft Word 2003/2002 (XP) documents if the Weak Encryption (XOR) was used. Autosave feature eliminates the need to watch the password recovery process, and will restore the work after a system crash. A friendly user interface provides quick access to all of the unique features of Word Password Recovery. Comprehensive help file, context help. Technical support via e-mail. Excel Password Recovery - Recovers lost passwords for Microsoft Excel documents . Outlook Express Password Recovery - Recovers lost passwords for MS Outlook accounts and PST files. Visual ZIP Password Recovery Processor - Recovers lost passwords for ZIP archives. Password Reminder - Find out your forgotten passwords easily. Handy Recovery - Restore files deleted due to virus attacks, software faults, power failures or disk formatting. VBA Password Recovery - Recovers passwords for Visual Basic for Applications (VBA) projects source code. Windows 2000/XP Password Recovery - Instantly decrypts and recovers the password to the user currently logged into Windows.